Come UFC 127: Penn vs. Fitch, Michael “The Count” Bisping will be facing off with fellow middleweight Jorge Rivera. 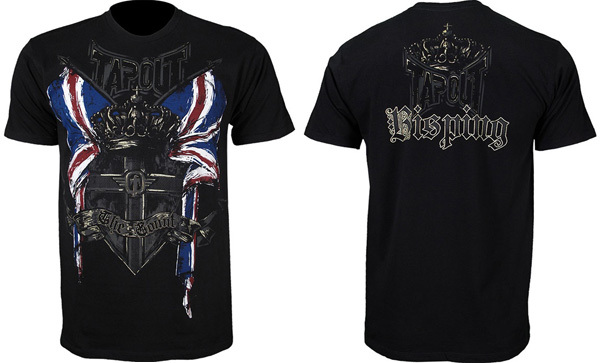 The Brit will walk out in his brand new TapouT Michael Bisping UFC 127 Walkout Shirt featuring a very English theme with his monicker on the front and a TapouT Logo along with a cryptic Bisping text on the back. We’re finally seeing the Silver Star influence on TapouT clothing in the new TapouT Michael Bisping UFC 127 Walkout Shirt. TapouT Michael Bisping UFC 127 Walkout Shirt available at MMAWarehouse at a very decent price of $23.99.